(718) 937-0490Serving all of New York City, Long Island, Westchester & Northern New Jersey. Premier hvac Service, design and installation. Our passion is keeping New York comfortable. That's why Standard Refrigerators is a third generation, family-owned business that has provided air conditioning, refrigeration, ice machine, wine cooler, heating and ventilation service throughout the New York Region since 1945. When central air conditioning became available in New York, we were one of the first to install and service the new innovation. Standard keeps your facilities comfortablE. Proactively maintaining your equipment can mean years of trouble-free operation with minimum emergency service required. This adds extra years of continued usage, increasing equipment life span and ROI. We offer design and build expertise for air-conditioning, heating, refrigeration, and ventilation projects. After reviewing site and facility plans, we take a step-by-step approach to each situation's unique requirements. Refrigeration and walk-in boxes designed, installed and operational on schedule. Operating on a closed loop chilled water/condenser water system. 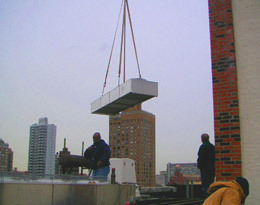 The approach was taken based on three previous projects Standard Refrigerators completed for the New York Blood Center. 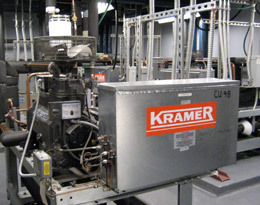 Standard Refrigerators removed and replaced of four existing Liebert dry coolers with new Liebert models while a computer room remained in full operation. The crane arrived on-site at 6:00 AM with the first two units off and two new units in place by 10:00 AM. The rig finished, with all systems up and four units operational, by 2:00 PM. No interruption in computer room services required. 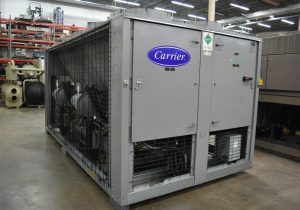 Standard Refrigerators, Inc. replaced a 15-year old, Carrier 75-ton air-cooled chiller while maintaining continuous operation of air conditioning and refrigeration. The replacement unit provided more capacity with a 20% reduction in power requirements. Refrigeration ran temporarily on city water while the chiller was disconnected at 7 AM. At 10 AM, the old unit was lifted off and by 11 am the new one was in place. All equipment was piped, wired and running by 4 pm. Copyright [oceanwp_date] - Standard Refrigerators. All rights reserved.